July 9th – 16th 2017 | Guest tutor Rowland Sutherland, jazz flautist. Five full days of tuition, four concerts, three Italian flautists, two piano accompanists and one long wonderful week of sunshine. Rowland introduced improvisation and a whistle-stop tour through the Jazz scales and how to swing beats. He was assisted by Jazz percussionist, Floyer Sydenham and Rowland brought with him a number of his compositions for flute ensemble. Rowland gave a stunning concert of contemporary and jazz pieces and thrilled all the participants with his stunning flute playing and relaxed charm. 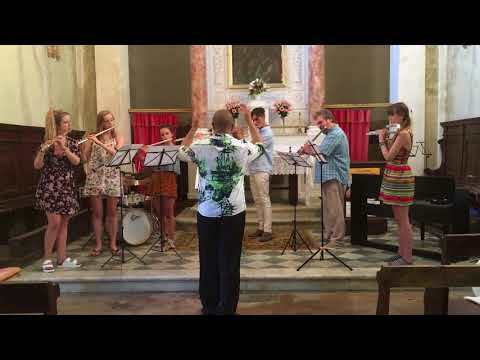 Elizabeth hosted baroque lessons and gave a special opportunity to all flautists that had prepared baroque pieces, to join her in a concert and perform alongside baroque cellist, Sebastian Comberti and Julian Walker on keyboard. The Tutors concert was performed by ’Silver Birch’ with music for 2 flutes and piano performed by Elizabeth Walker, Sarah Murphy and Sally Halsey.